This week, most of what I've worked on is the strip tube quilt, using a Sweetwater Pure jelly roll and Kona Snow for the background. The method is super quick, and using the jelly roll, I feel like I've had to do very little actual cutting. The making of it is a little boring, but it's coming together nicely and I'm pretty sure I will be happy with the results. There is no intended recipient yet, but it will likely be gifted as the colours aren't really "me". This quilt will eventually finish at about 50"x70" (what's shown is less than half of the rows complete), and I may add a narrow border to finish it off. Just today I received a little pack of fabric for my first bee block! The bee members are each making a triangle log cabin for Rebecca of Sew Festive Handmade. I couldn't wait to get started so I pressed the fabrics and sewed together the block this afternoon/evening. Very fun! choose a colour for borders and binding for the scrappy postage stamp top. 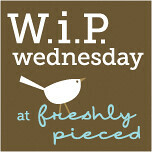 I'm still being indecisive, you can see the discussion here and offer your input if you like! Hee your last sentence made me giggle. 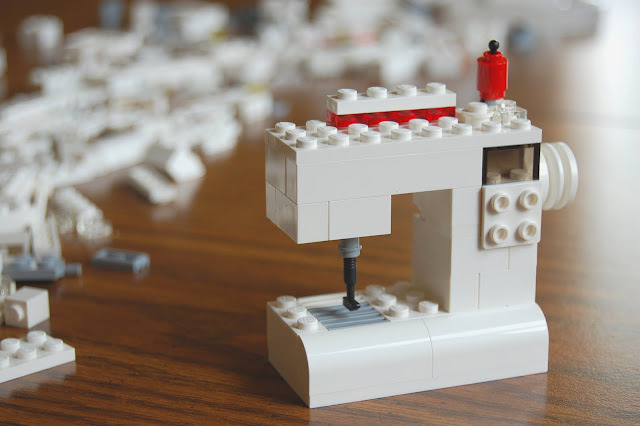 "A liiiiitle lego problem...."
haha - love the lego sewing machine. How fun. And your Pure quilt is coming along so nice!! Also love your new block! I don't think I've seen a triangle log cabin before - did you follow a tute? Very cool. Maybe you could do a tutorial for a lego sewing machine... then we could all have mother/son moments! I spent a sizeable chunk of my weekend putting together some sort of Ninjago contraption. The strip quilt looks great, love triangles! Love your triangle... And I for one really like your Pure quilt too. Too bad you're not loving the colors. I have to say i find them subtle but very, very soothing too. Love that triangle block, Heather! Your Pure quilt is looking great, too. Have fun with those new fabrics! A teeny tiny Lego problem, huh? ;) The Pure quilt is looking good! Love your strip tube quilt. And that Lego sewing machine is adorable! Your Pure quilt is looking so beautiful! And I love the Lego sewing machine. Love your projects, and that lego machine is just awesome!!! AHHHH I love the triangle! Eeee so excited! Everything looks great and I adore the lego sewing machine. I should get the addicts in this house onto that project. The lego's been packed away for a while now and i'm sure we bust it out it'll be used. Yes! I only have to wait six more years or so until my son is old enough to make me one of those Lego sewing machines! Loving the sewing machine! That is just too cute. And I love your pure quilt; can't wait to see more. Your jellyroll quilt is really cute. And yes, make the Lego sewing machine. Someone made one for me, copying my machine. It arrived last week and I LOVE LOVE it! Oh how cute! That pattern is just perfect for the blue and brown prints. Strip-piecing can get a little bit dull with some projects, but it sure beats cutting out and sewing all the itty bitty pieces by hand. I'm excited to see it finished!